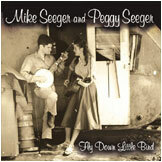 Mike and Peggy revisit songs they learned as kids from field recordings. Not "children's songs," these have a wide range in sound and subject: the quirky fun of Fod, the Poor Little Turtle Dove's lovesick plaint, a ballad in unaccompanied octaves, social commentary in The Farmer Is The Man, the spooky religiosity of Blood-Stained Banders. The two singers play various combinations of banjo, guitar, fiddle, harmonica, mandolin, lap dulcimer, and piano. Included in the booklet are Peggy's vivid evocation of their early listening experience and several early photos. Where Have You Been, My Good Old Man?